“So what was it like? !”, that´s the question many people were asking me after I came back from my seven day sailing trip to the Danish Island of Bornholm and back. This was the first time ever I sailed on a Beneteau yacht and since the company where I am employed started working for the market leader for production cruising yachts my interest was only natural. 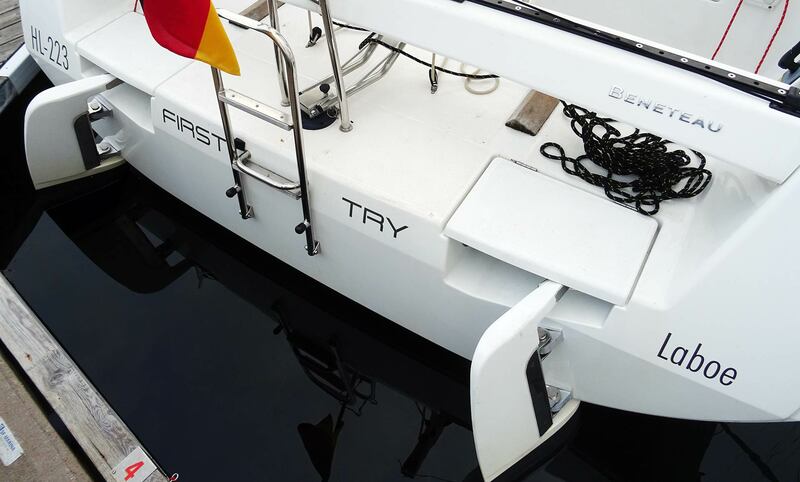 Here´s what I derived from going on a trip on the FIRST 30 as a small sea trial and review of this boat. The design of the boat is appealing, modern. Like a cat ready to jump the hull has an aggressive, racy look, reminding of her bigger Open-class racers. There is no Teak except for some pads on the cockpit flooring. Although she is marketed as a performance cruiser there is nothing “cruisy” about her design from the outside: She wants to be noticed as a racer. And I like that very much. 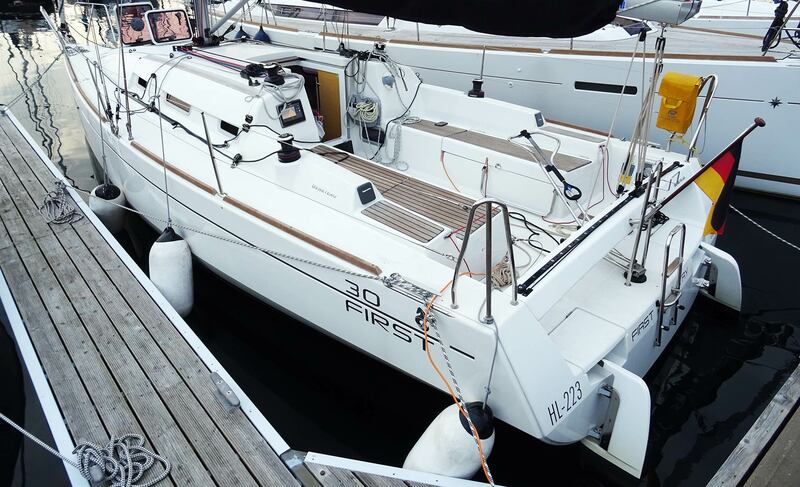 This last version of the Beneteau FIRST 30 was introduced in 2011 and production was halted in 2015. The First 30 has an overall length of 9.85 metres with a max beam of 3.21. Her maximum draft is 1.90 metres with a T-keel and lead bulb. A very reliable Yanmar 20 horsepower Diesel engine powers her when not sailing, the engine is sufficient for maneuvers and steaming along in flat times. Fore sail has an area of 26 square metres, main sail features 27 square metres. 160 litres of fresh water can be poured into the tank situated in the bow area (good for the trim!) and 30 litres of Diesel in the tank. Let´s hoist the sails! I must admit when we started sailing the FIRST 30 I was a bit disappointed. But that´s always the case with (maybe overly exaggerated) expectations. The FIRST 30 is in no way an all-out racer! And I don´t know what I was expecting, but this 3.7 tons boat won´t start to plane as easy as a Pogo. She just won´t. She is a good sailing boat and was responding even to light puffs. We reached maximum speeds of around 8 knots, when trimmed and in a steady force 4 she could go some 7.5 knots steady upwind. Which is a nice speed with quite some nice heeling. Nevertheless, I must also admit, that I never really “got warm” with this boat. It´s nothing in particular and nothing that I could specifically identify by name. But it´s a sort of feeling. When we´d had the sails up and had her sailing, even when everything was fine, I just couldn´t get away this slight feeling of … well, of the boat being unbalanced in some sort. Nothing that was bothering me or even hindering me, but a slight discomfort. Maybe, as my sailing mate told, this was my “drive to constantly trim the sails” on a boat like this: I don´t know. 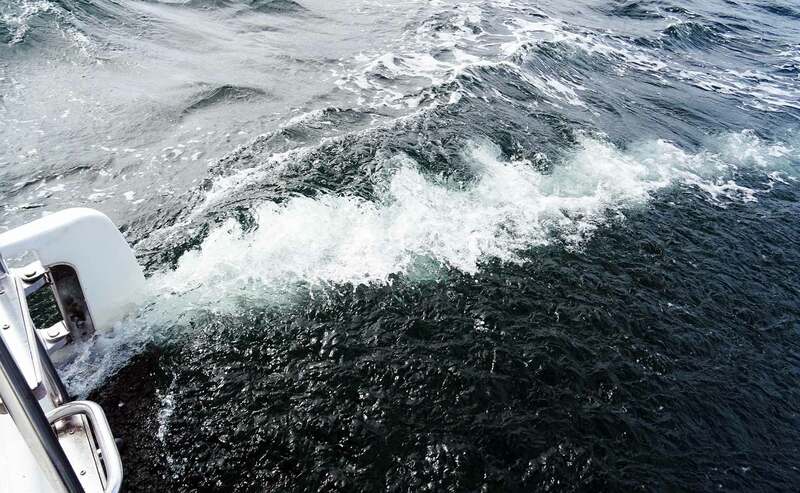 I just guess, the seven days on board was too short to really get to know the boat and the things she is capable of. As I said: She is a fine sailing boat, easily responding and jumping to speed when wind is blowing. 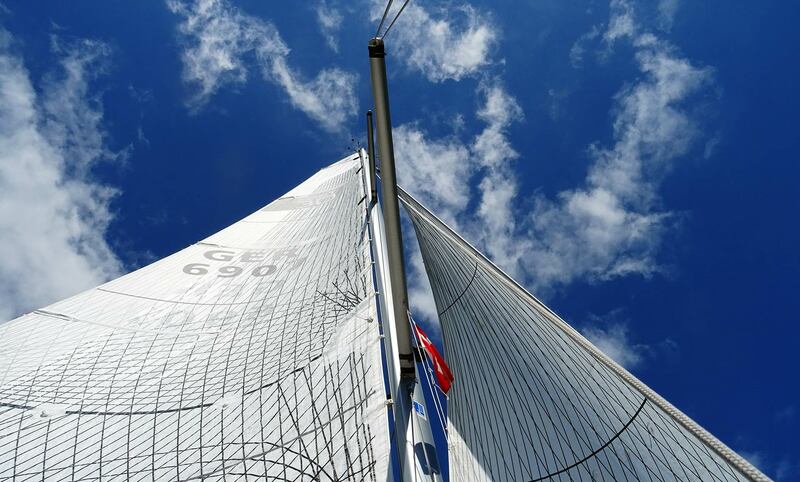 As she is just a 30 feet boat, handling her lines and sails is a no brainer. Even in strong winds with lots of swell (that´s fun on a small yacht like this!) reefing process was done in a matter of minutes without hustle. Nice! 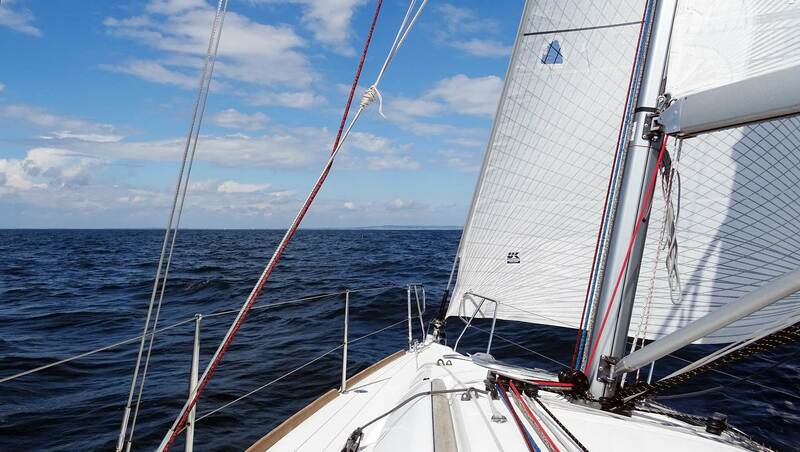 I must say, we particularly loved the steering properties of the Beneteau FIRST 30. This is done just perfect by Juan-K. Although the owner warned me that the rudder blades – from his point of view – could be too small in some circumstances, we never had any reason for complaints whatsoever: The stable and rigid tiller from stainless steel gives a direct and immediate response from the blades and the water flowing around. The helmsman may hold the boat exactly at the “edge of the wind”. The boat is responding in an instant. Being helmsman on a FIRST 30 is pure joy! The racy feeling is complemented by a solid, simple mechanic (good for maintenance and repairs) and it´s just loads of fun, guaranteed! Even in slow speeds in marinas or when maneuvering to the jetty, the small rudders did a wonderful job. Done with caution, the steering even going stern first was very direct and a skipper can land the FIRST 30 very precisely to her mooring site. She just needs some little speed and she´s fine on the rudder. A skipper must remember that double rudders won´t be directly streamed in by the screw so the boat always needs a little speed to respond. 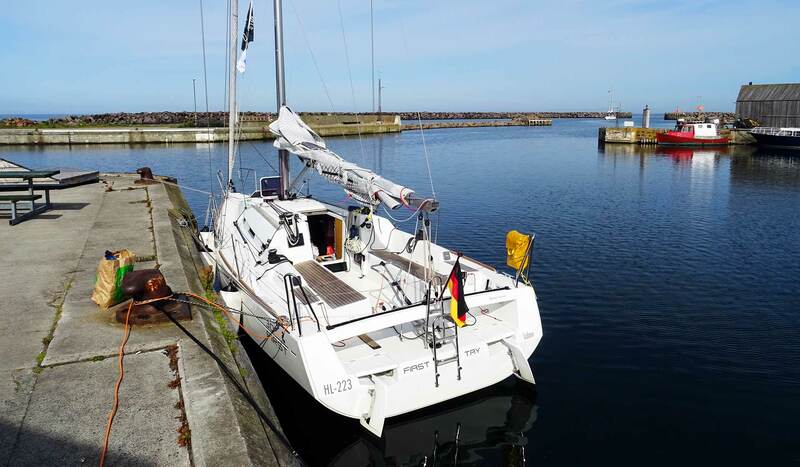 All in all: Excellent steering properties, her sailing capabilities must be “explored” by the sailor, it needs some time – the FIRST 30 is a boat for the second date, I would say. The FIRST 30 was marketed as a racing cruiser with an emphasis on performance and I can state that the boat lives up to this promise quite nicely. 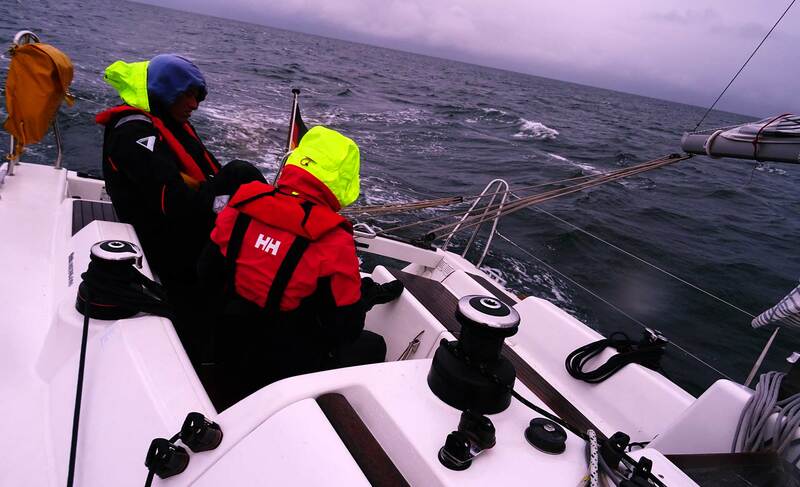 She is not an all-out racer for sure, this in mind, a small crew can sail fast and retain a certain level of comfort as well on longer trips like we did on our 7 day Baltic cruise. There is a lot of space both in the cockpit and below deck. Although the boat may be sailed with 6 persons, our charter company recommended 4. We finally set sails with 3 and I found this crew size more than enough on a trip like this. The cockpit benches are sufficiently sizes and offer a convenient width for both sitting there working the sheets or reclining and having a decent sunbath. The length of the benches fit to an adult person´s body size, with bent knees two adults will fit with ease on each bench. 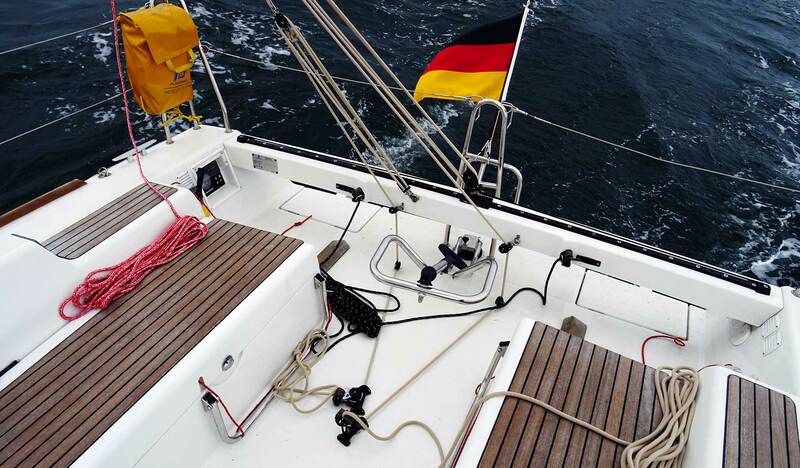 There are very rigid stainless steel stirrups which can be adjusted and folded away for sailing heeled which will provide for a safe and firm hold of the sailor´s feet. The coamings are perfectly sized for the crew´s buttocks when sitting high up and heeled. You´ll always have a nice view over the boat – everything other than this would have surprised me considering the short length of this yacht. The only thing bothering me was the low hanging boom whilst maneuvering, but again, that´s a price you´ll have to pay on a small yacht. Mainsheet roping is similar to a jolly-boat. The mainsheet and vang are fixed with a cleat on the cockpit floor. Traveller sheets are also down on the flooring which may cause a mess during and after the boat performs a gybe or a tacking maneuver. 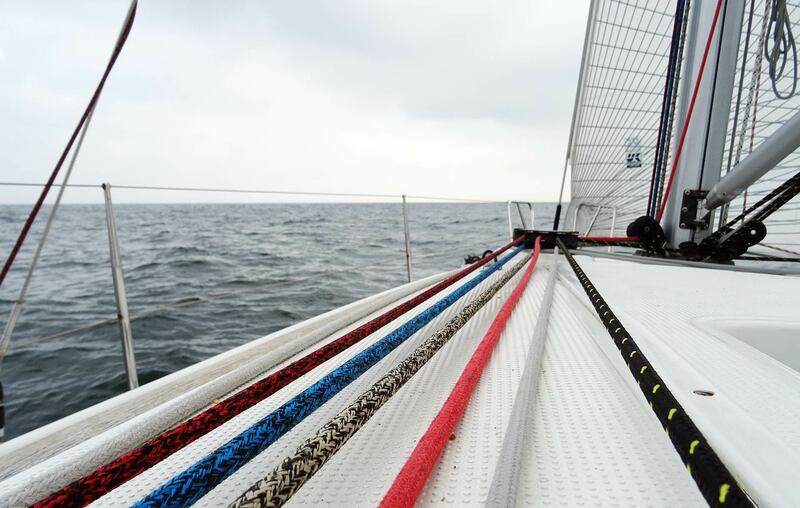 So keeping the lines tidy and in order by constantly coiling up the ropes is a definitive must – besides, that´s always and on every boat a good idea and a sign of good seamanship. Although we didn´t really went into fine trimming the main sail, the large traveller offers the whole width of the stern for tuning. Nice! Also nice: The perfect autopilot and the huge, huge locker on starboard. 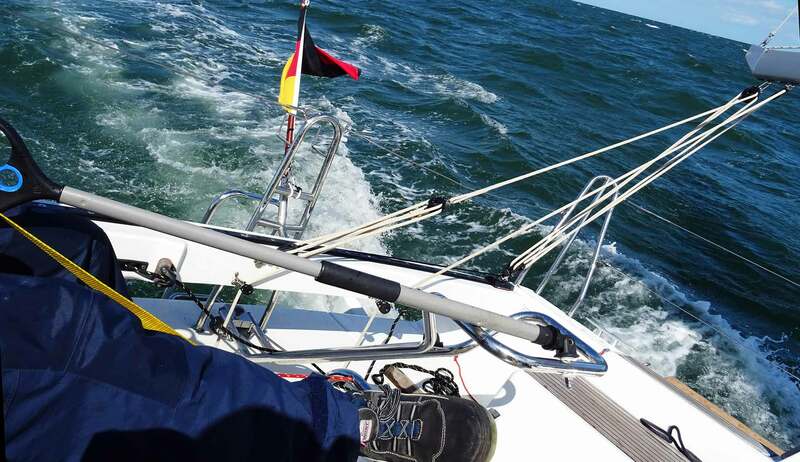 So in the end, the Beneteau FIRST 30 wants to be a thoroughbred racer, but upon coming down the companionway, a whole different flair unfolds: Cruising time! Of course, after my two sailing mates arrived with large carry-alls we had to put them anywhere. Since the aft cabin offered less stowage than clothing, they lived out of the bags which had to be placed in the saloon. This narrowed the space available, nevertheless, for a 9 metre-boat, the FIRST 30´s saloon is very, very roomy. Two three-seater settees facing a folding table for dinner, quite some nice wooden fittings create a modern yet very cozy atmosphere. We liked the interior design very much. Seeing the saloon so full of clothing, you might now understand my recommendation to not go on a longer cruise with the FIRST 30 with more than 4 people. It´s just too small. Anyway, with us three, it wasn´t a problem at all. We could also stow away all the food and water provisions for a complete week as both the fridge and the stowage underneath and behind the sofas in the saloon are big enough to be stuffed with food. It´s really a big, big small boat! Cabin size was more than sufficient, again considering the size of the boat. 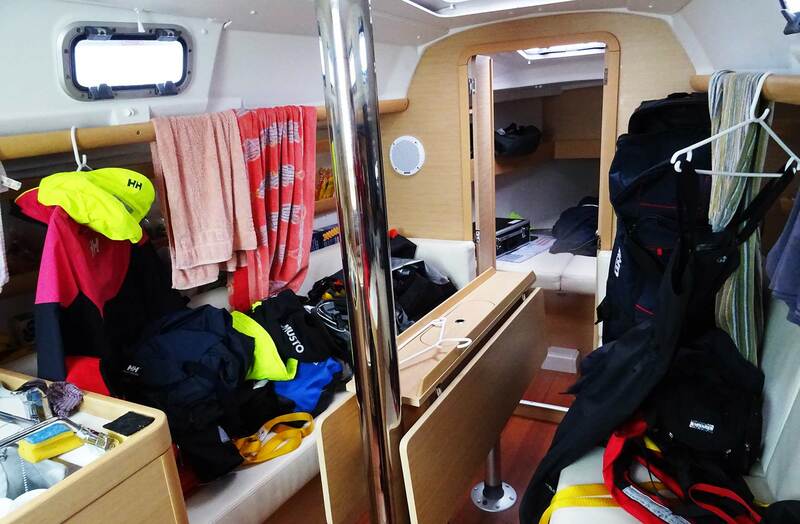 I´ve seen much smaller cabins on 31 or 32 feet boats as well. Though lockers and cupboards in the aft cabin are lacking, the fore cabin was more than well-equipped with stowage for my clothes. 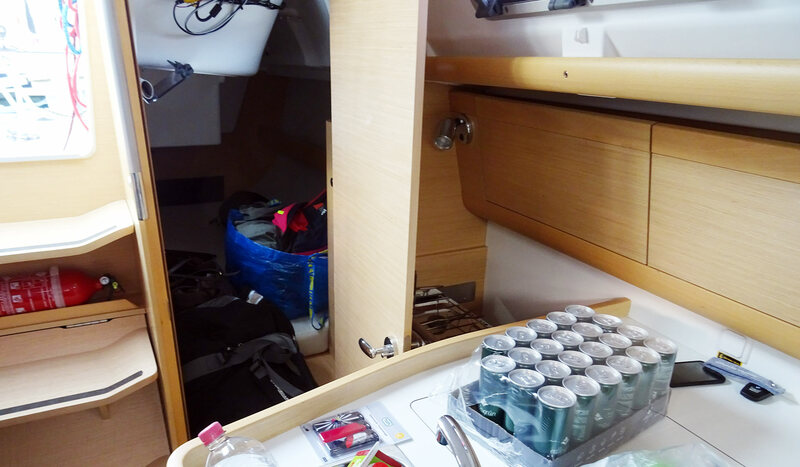 I liked the fully equipped galley with her 2 flame stove and the considerably sized fridge. A role model was the navigation station with a full fledged forward facing chart table, a bend seat for working in heeled condition. The switch panel VHF and secondary chart plotter are well within reach and sight. Very, very nicely done! In the end, what´s the Beneteau FIRST 30 designed by Juan K like? First of all, I liked my time on board very much and my two mates enjoyed it as well. Surely, on charter yachts are always some issues and ours was not an exception, but that´s something different. The FIRST 30 is a nice, vivid little sailing yacht. She offers huge space for her size and a handful of very intelligent solutions. I loved her nav-station and the huge, huge aft locker in particular together with her – from my point of view – terrific steering properties. She appears to be very stable and stiff, can take huge loads of the wind and heels very nicely. She seldom loses her temper, it takes a lot to bring her to the edge. But she is also a boat with her own, very special character. As I was pointing out in the beginning, I never really “got warm” with her. Not a feeling of discomfort, but a sense of “there´s something not quite perfectly balanced yet”. Something, I cannot describe properly. I guess – and that´s what owners told me – it takes some time to get to know each other and adjust to her properties. What was a downside for sure was her big tacking angle of considerably more than 100 degrees – she loves reaching and running. In the end, I waved a Good Bye and felt bad upon leaving her: She was fast an fun and at the same time safe and reliable. I think, that´s what counts in the end. I liked the FIRST TRY, the sprinting Beneteau FIRST 30. Can you guess why was the project F30 canceled?